It was a surprisingly warm spring afternoon in Guangzhou. As arranged, I met Kendall in the square behind his new apartment, slap bang in the center of town. He’d discovered a quaint ‘tea garden’ just around the corner and we were hoping it would prove a great place to meet to talk and drink tea. The tea garden was set in a local residential square and run by a small tea shop on the corner. They had decked the place out with small tables and comfortable wicker chairs and it was surrounded by towering giant bamboos to block out the typical scorching sun and heat here in the south of China. A small peaceful oasis away from the hustle and the bustle of modern Guangzhou, where locals would bring their song birds, drink tea and chat. We sat down and had a quick look at the tea menu. We ordered some white tea and within a few minutes there was a bubbling kettle and a Gung Fu Cha set on our table. The white tea looked rough but fortunately, I had brought some Yan Zhong Lan or Orchid Amongst the Cliffs . 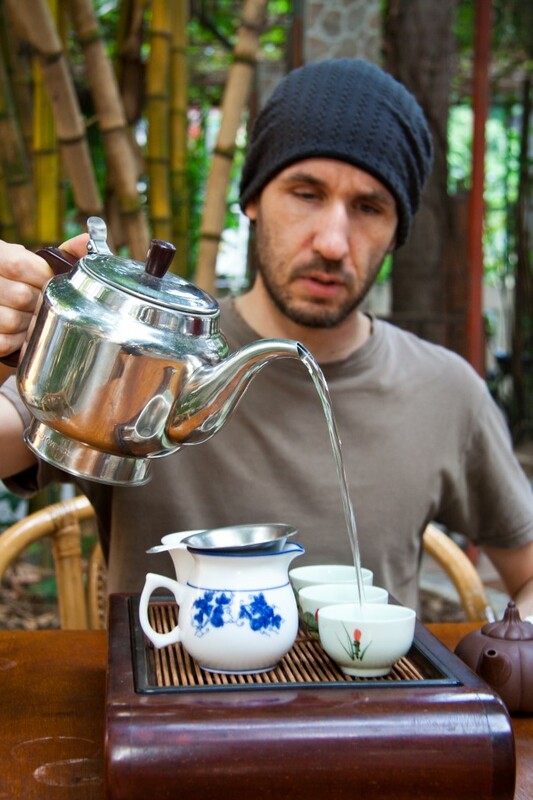 Unfortunately, the local tea lady insisted on brewing up the first pot, so we ended up drinking the white tea first. Finally, the Chinese lady left us to our own devices. We set the remainder of the white tea aside and replaced it with the Wu Yi tea. I instantly felt better! I had told Kendall that the smell was pure ecstasy and he had to agree. It smelt damn good! The orchid aroma was fantastic and the rockiness of the tea superb. We whiled away the rest of the afternoon enjoying the tea, the pleasant weather and the charming surroundings.